The Democrat Secretary of State of Maine is refusing to investigate sworn affidavits presented by 17 residents of the state’s 1st Congressional District that they were erroneously given ballots to vote in the 2nd Congressional District race between Rep. Bruce Poliquin (R-ME-02) and Democrat Jared Golden. When Maine voters stepped into the voting booth on November they cast traditional ballots for state offices, but voted for their first, second, and third choices in the one federal race for the U.S. Senate the two federal races for the U.S. House of Representatives. In order to be declared the winner, a candidate for federal office had to receive 50 percent plus one of the first place votes cast for the office. If no candidate received more than 50 percent plus one of the vote, then the second choice votes and third choice votes cast by voters whose first choice votes were cast for the third place and fourth place finishers were then allocated to the top two candidates based on the proprietary computer algorithm of the outside vendor selected by the Democrat Secretary of State. In the November 6 election, Republican Poliquin finished in first place, receiving 131,631 votes, or 46.41 percent of the 283,643 votes cast that day, according to election results provided by the office of Secretary of State Dunlap. Democrat Jared Golden finished in second place, receiving 128,999 votes, or 45.48 percent of the 2 votes cast that day, 2,632 fewer than Polquin. Independent candidate Tiffany Bonds received 16,260 votes, or 5.73 percent of the 283,643 votes cast that day and finished in third place. Another independent candidate, William Hoar, received 6,753 votes, or 2.38 percent of the 283,643 votes cast that day and finished in fourth place. Bonds and Hoard received a combined 23,013 votes. The implementation of that system, however, turns out to be highly controversial and has disenfranchised more than 8,000 voters who cast their first choice ballot for third place finisher Bond and fourth place finisher Hoar. Golden received 10,232 votes from voters who had declared in the November 6 election either Bonds or Hoar as their first choice, presumably declaring him on their ballots to be either their second or third choices. These additional votes gave Golden a new total of 139,231 votes, or 50.53 percent of the 275,557 votes counted in Round 2. Poliquin received 4,695 votes from voters who had declared in the November 6 election either Bonds or Hoar as their first choice, presumably declaring him on their ballots to be either their second or third choices. These additional votes gave Hoar a new total of 136,326 votes, or 49.47 percent of the 275,557 votes counted in Round 2. Only 14,927 of the 23,013 votes cast in support of either Bonds, the third place finisher, or Hoar, the fourth place finisher, were reallocated to Poliquin, the election day first place finisher and Golden, the election day second place finisher, in Round 2. A total of 8,086 votes cast by supporters of Hoar or Bonds on election day were thrown away and not counted in Round 2 voting–“spoiled” is the legal term used–because, according to the Secretary of State, did not include choice rankings beyond the first choice. As a result, on November 15, Dunlap declared Democrat Golden the victor by more than 2,000 votes. Last week, however, the Maine Republican Party released affidavits from several voters in the 1st Congressional District who said they had erroneously received ballots from the 2nd Congressional District at their local precincts. Similar affidavits presented in another state in another election–North Carolina’s 9th Congressional District race between Republican Mark Harris and Democrat Dan McCready–caused the North Carolina State Board of Election such concern that they refused to certify Harris’ 905 vote election day victory. In Maine, however, Democrat Secretary of State Dunlap viewed such sworn affidavits differently. On Friday, Dunlap’s office announced he would not investigate those election irregularities, as the Maine GOP requested. 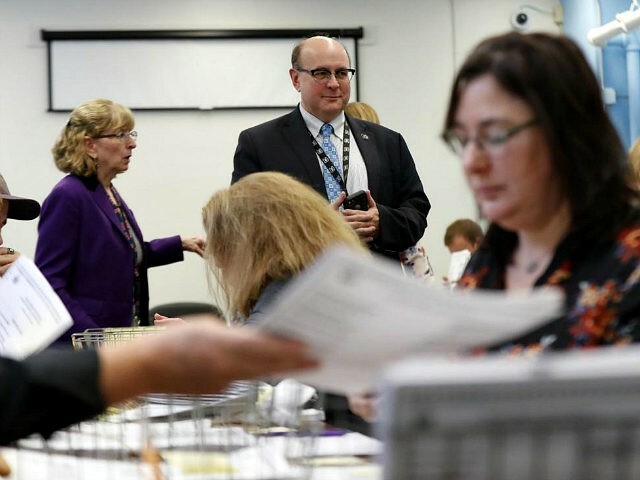 A spokeswoman for Secretary of State Matthew Dunlap, a Democrat, said Friday the office had seen no evidence to support claims that some voters in up to four towns in the 1st Congressional District received ballots for the 2nd Congressional District. Last week, Dunlap authorized a recount in the 2nd Congressional District race, which is expected to take four weeks. A federal judge is expected to issue a decision this week in a lawsuit brought by Poliquin and three other voters in the 2nd Congressional District arguing that Maine’s “rank voting” system is unconstitutional.